Purchase single-day general admission tickets, print online, and prepare for fun! Enjoy UNLIMITED visits, EXCLUSIVE discounts, and MORE with a Season Pass! Groups of 15+ and companies of 75+ enjoy special discounts when single-day tickets are purchased in advance! SAVE $5 BY PURCHASING ONLINE! This ticket is valid for April 6 - May 5, 2019. Water Park opens May 11, 2019. Please check the calendar for operating hours. 3 years old and younger are FREE. Buy, Print, or Save to Phone & GO! *Arkansas State Tax is 11.5%. SAVE $10 BY PURCHASING ONLINE! This ticket is valid for any operating day in 2019. Includes access to both Theme & Water Park! Buy, Print or Save to Phone & GO! GOOD ANY DAY JR. / SR.
SAVE $15 BY PURCHASING ONLINE! This ticket is valid for any operating day in 2019 when purchased at least 5 days prior to visiting Magic Springs Theme & Water Park. This ticket is valid weekends Sept. 28 - Nov. 3, 2019. Includes access to Theme Park. Includes access to haunted attractions. *Arkansas State Tax is 11.50%. A Season Pass pays for itself in two visits! PLUS An ENTIRE Season of FUN! What Do I Do If I Lost My Ticket Vouchers, and I Can’t Find My Confirmation Email? 1. Visit the Magic Springs Theme & Water Park online store. 3. Click on “Order Search,” located roughly halfway down the menu. Please Contact us at info@magicsprings.com for assistance on obtaining your confirmation email. For assistance with an online order please visit our Online Support Page or Technical Support is available by calling (407) 261-4284. Discount tickets are not available for purchase via our online mobile store if you are at the park or within park property. All ticket prices are plus 11.5% state tax, .65 city admissions tax, and online ticket prices are plus a $6.99 processing fee per order. Season Passes are valid only on specified regular operating days during the season printed on the card. 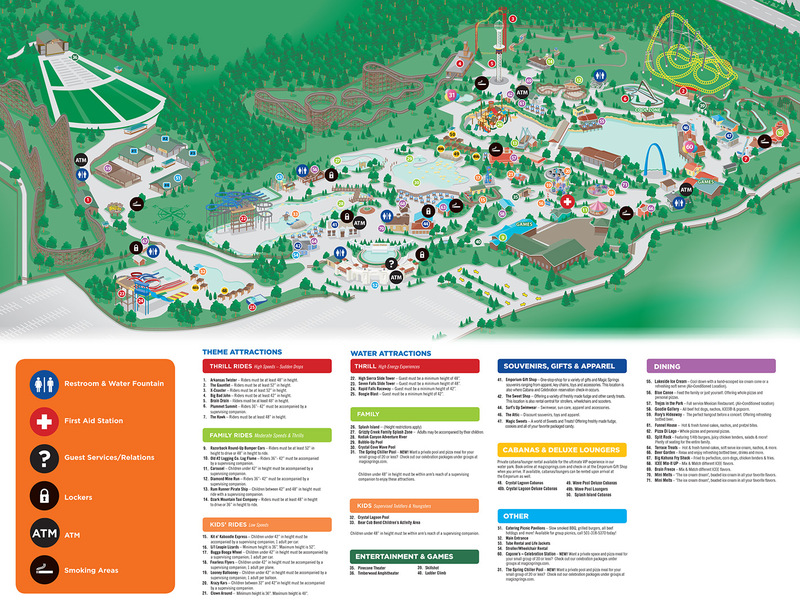 Lost, stolen, or misplaced Season Passes may be replaced for a fee of $10 plus tax at Guest Relations or Ticket Window and then proceed to the Season Pass Processing Building to obtain a reprint. A Season Pass cannot be used by any other individual; only the owner of the Season Pass may use the pass. One ticket, voucher or season pass per person. No cancellations, refunds or exchanges; tickets will not be replaced if lost, stolen or unused. Tickets may not be copied or resold and may be used only once. Duplication will result in revocation without refund and ejection. To request a name change, purchaser must accompany the new Guest, and present photo ID and ticket/voucher at Season Pass Processing Building. Ticket or season pass voucher not valid at other parks, or during private parties/blackout dates. Operating dates, hours, prices and policies subject to change without notice. May not be combined with any other offers or discounts. Some special events may require an additional charge. Prices, dates, hours, and attraction availability are subject to change without notice. We reserve the right to be closed to the public and season pass holders for private events. Availability of rides, shows and attractions are subject to change without notice. A ticket or pass is a revocable license and may be confiscated with no refund of purchase price. Violation of park rules will result in expulsion. A copy of park rules is available upon request. Conduct that is disorderly, disruptive or in poor taste is prohibited. Clothing with inappropriate/offensive words, phrases or graphics are prohibited. While in the theme park (if applicable), shirts and footwear with soles must be worn at all times. Only tickets/season pass vouchers obtained from Magic Springs Theme & Water Park or offices authorized by Magic Springs Theme & Water Park to sell/distribute will be honored. Not valid if reproduced in any manner. Resale of tickets/passes is strictly prohibited. Due to maintenance and other circumstances, certain rides and attractions (including new rides) may not be open to the public. Admission to certain rides, shows, attractions, special events and concerts may require an additional charge or be subject to pre-sold admission. Tube and other rentals, merchandise, food, games and arcades require additional fees. The bearer of the ticket or season pass voucher grants Magic Springs Theme & Water Park the right to film/video/photograph the bearer on park property for any purpose without payment or consideration thereof. Magic Springs Theme & Water Park assumes no responsibility for accident or loss to any person in connection with the condition or use of the park, rides and amusements or their entrance into or departure from the park.